I started growing my own micro greens for my food blog and I love having these flavor and nutrient packed little gems of greenery on hand. But they grow really fast and if you don't harvest them properly you end up with a full size plant. Suddenly I with awash in a mini jungle and eating salads as fast as I could when realized I could use them in my cocktails as well. INGREDIENTS: 1-1/2 Oz. Light Rum 2 Oz. Cucumber, Diced 1 Oz. Lime Juice 4 - 5 Fresh Pea Shoots 7 - 8 Fresh Mint Leaves 2-3 Tsp. Raw Wildflower Honey* (Use Tablespoons for a sweet cocktail) Club Soda Mint Infused Sugar for Rim Cucumber Slices Mint Sprig Pea Shoots Cracked Ice * 2 - 3 teaspoons of honey will make this a dry, or more savory style cocktail. If you prefer more sweetness use 2 - 3 tablespoons instead. DIRECTIONS: Peel off a nice, long strip of cucumber, roll it into a rosette and pierce with a cocktail pick, set aside. 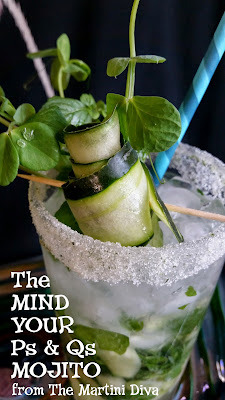 Rub the rim of your glass with either a cucumber or lime slice then roll in the mint infused sugar and set aside. Dice your cucumber. Add the cucumber, lime juice, pea shoots, mint leaves and honey to your glass and muddle gently to release the juices and express the mint oil. Fill the glass with cracked ice, pour in the rum and top off with the club soda. Garnish with a few pea shoots, cucumber slices, mint sprig and serve with a straw. 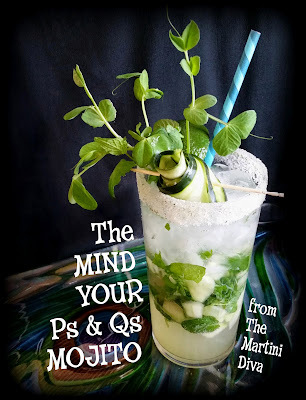 A Mojito is a traditional Cuban cocktail wilth an interesting background. For a fun read and more on the Mojito, check out what David Wondrich has to say over at Esquire Magazine.